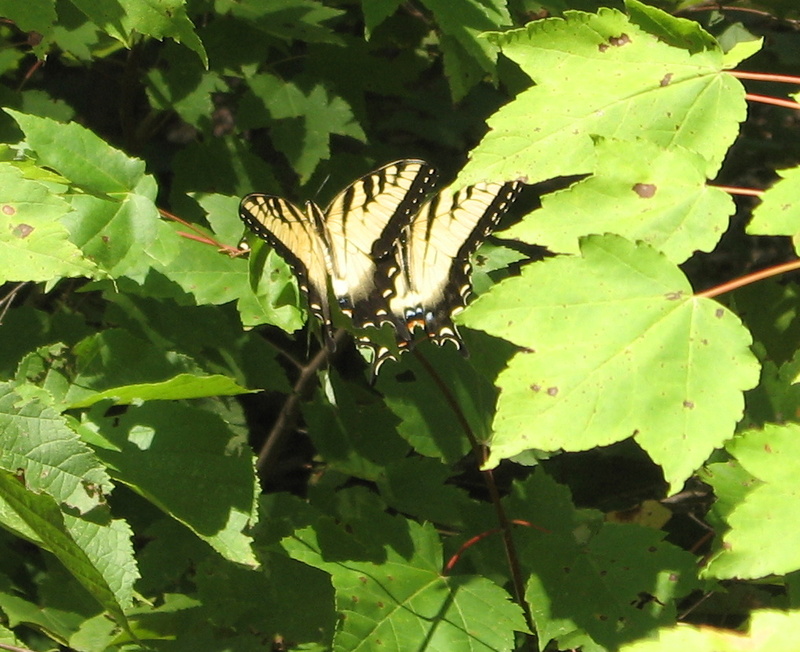 Hikers love the birds, bears, and butterflies living in Shenandoah National Park (SNP). Not so loved, at least by SNP naturalists, are the non-native plants that are crowding out the park’s native plants. Liz Lyons, John Shannon, and I joined SNP ranger Cindy Blugerman to try and make a dent in two varieties of invasive plants infesting SNP: Japanese stiltgrass and lady’s thumb. 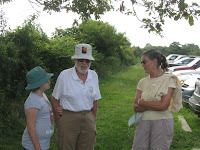 We met Cindy and one other volunteer at Big Meadows at 10 a.m. on this cool August morning. Cindy showed us how to identify the two invaders, and we set to work pulling and bagging them. Liz and I worked off the left side of the Story of the Forest Trail (the park service had sprayed the right side with something to kill the stiltgrass). John focused his attention on the right side, beginning with removing some bittersweet. Quite a few hikers stopped to ask Cindy what we were doing. Hopefully, that information will increase public awareness of the danger SNP faces from invasives. We worked until shortly after 2 p.m. All told, the five of us had filled 11 30-gallon trash bags with noxious weeds. Cindy gave us t-shirts and caps with volunteer logos, and the rain that had engulfed Charlottesville most of the day held off until after we left. 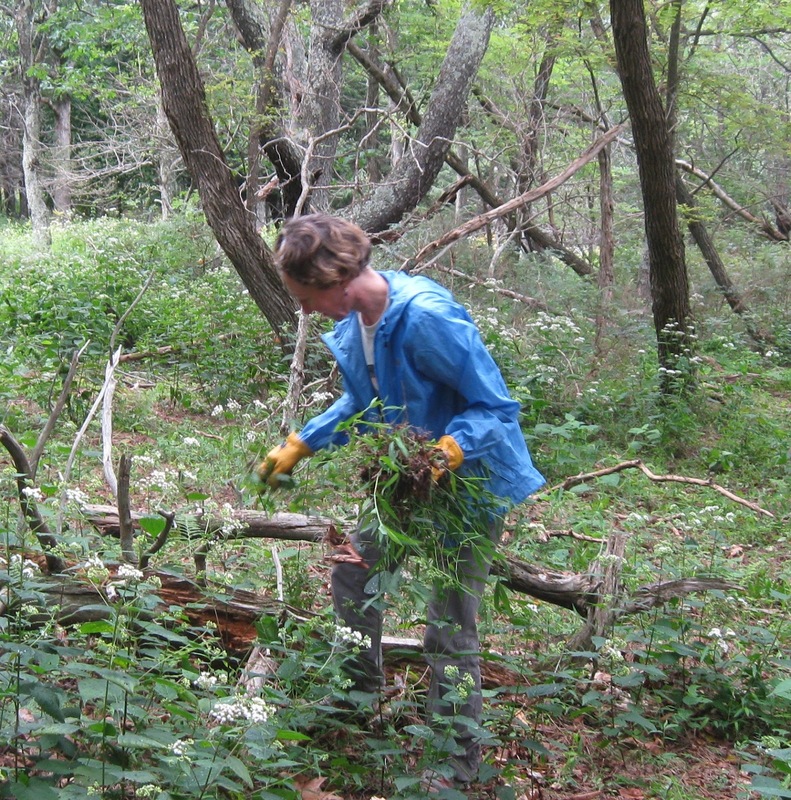 Earlier this year, illness kept overseer Connie Wright from her normal trail work of keeping a section of AT north of Doyles River Trail cleared. To help out, Ruth Douglas and I did some clearing on the southern half of this section earlier this summer. Now the Flying McLeods wanted to help out, too. Al Dahler and I cleaned out waterbars, and I did some remodeling of some to try to get water to flow off the trail better. Thanks to previous trips with other members of Charlottesville Chapter, numerous drainage structures were working, so today's project involved maintenance and improvement, rather than building or rebuilding. Warm sunshine and flies buzzing around us made this work tiresome. After reaching an overlook halfway along, Al and I were tired of digging dirt, so I swapped a McLeod to loppers while Al took a break. Mark Gatewood cleared vegetation with a brush cutter, until it stopped working. Mark had hoped to meet Connie Wright coming from the north. He ended up driving to Simmons Gap Ranger Station in an unsuccessful search for a working brush cutter, so he instead started cutting his way south with a swingblade. I met him in an area of tall pokeweed that crowded the trail, along with some briars in the mix. The weeds were easy to cut but were abundant. After opening up a section that was narrow, it was time for me to head out, with a couple of stops to slow bittersweet that will kill the few trees and make weed and shrub growth worse. A new co-overseer recruited during the Little Calf Mountain relocation will help keep this heavily used section in good condition. 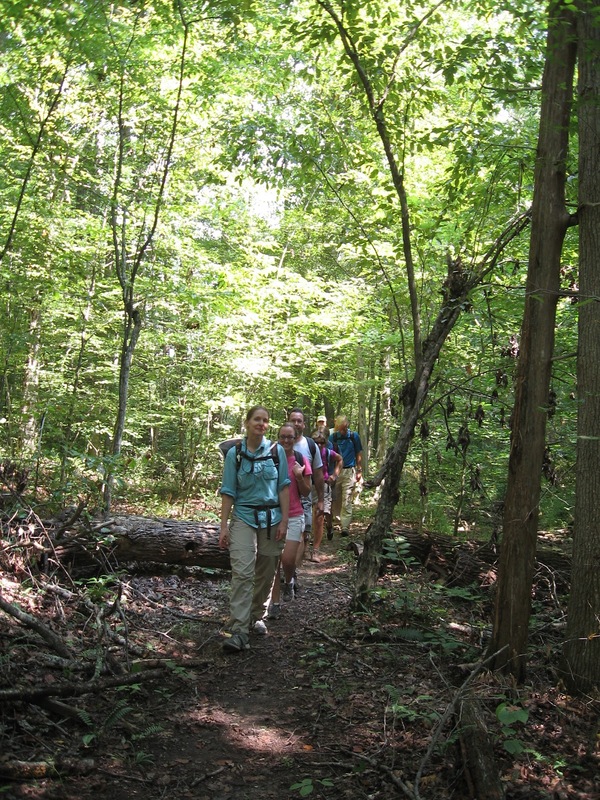 Today’s hike would be something a little different: we would travel southeast to the state park closest to Charlottesville and try out the park’s hiking trails. Today’s hike was originally proposed as a “reserve” hike that could be substituted when excessive summer temperatures prevented longer hikes or when Shenandoah National Park or the Blue Ridge Parkway were closed in winter. The most questionable thing about this choice is the travel distance (1 hour, 25 minutes) for a relatively short hike (4.5 miles). Unlike most of our hike leaders, this one always does his best to stress the disclaimers and see if he can talk people out of the hike. That tactic resulted in no takers (leavers?). Leon Gorman and I drove individually, while seven others (John Brandt, Joanne and Maynard Davis, Niki Mason, Debra Fisher, Briana Taylor, and Marian Styles) split into two cars. My biggest fear about today’s hike was losing someone en route to our Cumberland County destination, not on the hike itself. I was very relieved when all vehicles arrived at the park. The hike meandered in a circle around the dammed lake of Bear Creek, and the lake came in and out of view as we walked. We immediately saw a great blue heron cruising along just above the water. This sighting made up for not seeing the beaver ponds that were here in late winter. The low water levels of August somewhat took away from our lunchtime stop. What was usually a beautiful brook was now a dry bed. We made the best of it, though, and shared a pleasant lunch. The next decision was “to swim, or not to swim.” When (Mer)Maid Marian strolled down to the beach for a look, I assumed the answer would be affirmative. Marian’s deciding to not swim is a rare event. But this did occur today (to John Brandt’s deep disappointment) because of too many pint-sized swimmers and the lack of an island to swim to, like at Sherando. Unusually comfortable temperatures also lessened the motivation for a dip. So we started thinking about ice cream “dips” instead. We jumped in our vehicles and headed homeward through the wilds of Cumberland and Buckingham Counties. We kept our four-car caravan together while heading back over the James River to the (relative) civilization of Fluvanna toward the Gypsy Gourmet Cake Lounge. Leon did not stay, but the rest of us eagerly consumed ice cream, cappuccino, lattes, tiramisu, and other goodies. As we headed back to Charlottesville, it occurred to me that we may have gained more calories than we burned on the hike. In any case, I hope that something different was something good today. 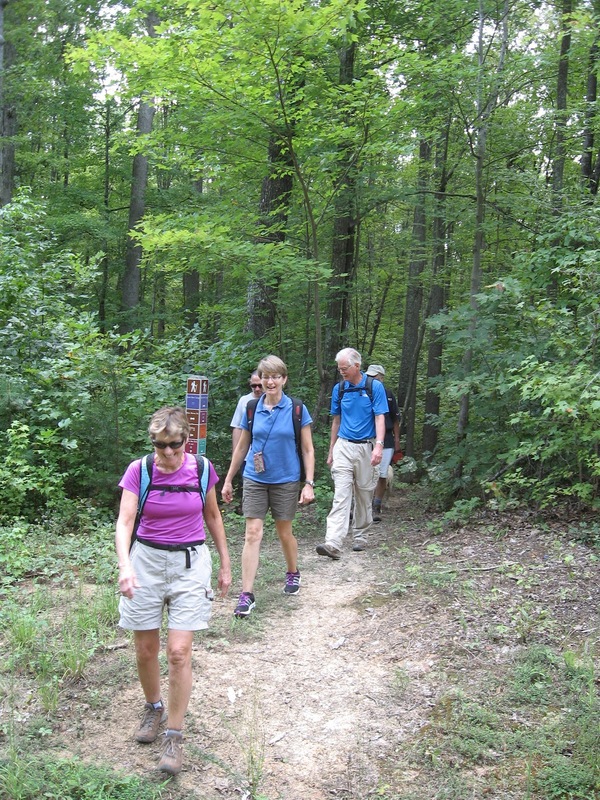 We celebrated the 75th Anniversary of the completion of the Appalachian Trail onAugust 11 with a hike along the white blazed trail from Rip Rap to Black Rock summit and return for a total of 8.6 miles. 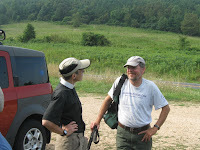 The hike was lead by Pete Fink with assistance from Lindsay Brown. A good crowd met for the car pool including Brad Young and his daughter Savannah, C.J., Dan Ralston, Bev, Rita Kieffer, Liz Lyons, and John Shannon. C J's friend Andrew met us at the trail head and we started out right on schedule. It was a nice day, not too hot and the hike went smoothly with a little "huffing and puffing" as we approached the summit. During lunch on the rocks Lindsay gave a short quiz on the history and characteristics of the Appalachian Trail. The group did very well and grades will be published later in the 21st Century. Prior to reaching the summit Brad and Savannah had to turn back so our group was diminished, however, while eating lunch John Brandt "materialized" as he often does and completed the trip with the group. Of course during the hike Dr. Shannon did a fair amount of trail clearing with some help from John Brandt and Liz Lyons. I look forward to the celebration of the 100th Anniversary. The repainting of Dunlodge continued this weekend. A crew of young workers from northern Virginia made a lot of progress painting the exterior walls and shutters. 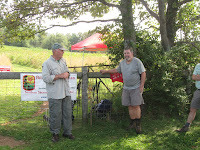 Thomas Jorgensen directed activities both days, and cabins supervisor Mel Merritt also made a long trip to help. Don Davis tended to numerous projects. John Shannon continued trying to push back bamboo and English ivy in a couple of spots. One person who saw Dunlodge early on was impressed by the near disappearance of one bamboo patch. Of course, the full Dunlodge experience had more to it. On Friday and Saturday nights, people emptied beer and other bottles, plus enjoyed mountain pie and fireworks. After 20 years, the project to relocate the Appalachian Trail between Beagle Gap and Little Calf Mountain changed today from a construction project to routine trail maintenance. 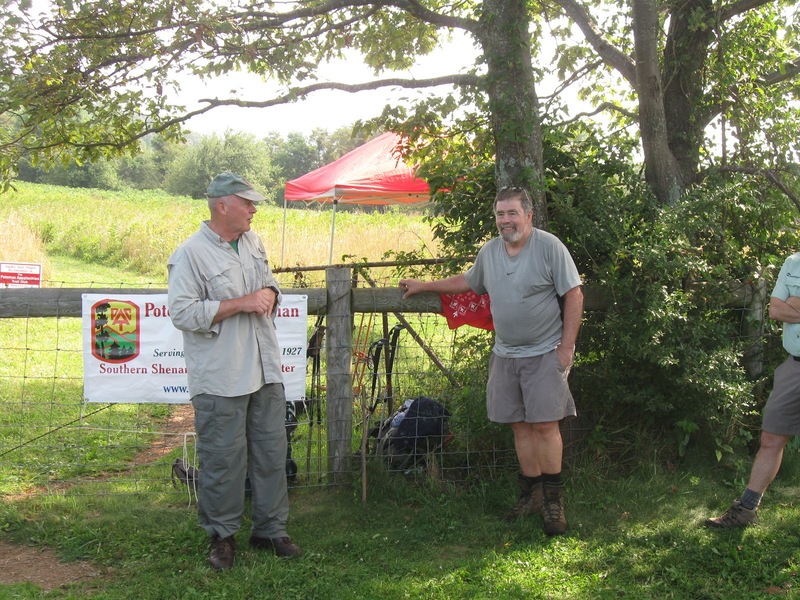 At Beagle Gap, a ceremony to dedicate the new section of trail drew a group of PATC members, Shenandoah National Park employees, and Appalachian Trail Conservancy representatives. PATC president John Hedrick addressed a group. Then Reverend Heather Warren, a trail maintainer, gave a blessing, followed by an address by Robert Proudman from the Appalachian Trail Conservancy. We then celebrated by using the trail. Two groups, intermingled at first, headed up the trail to Little Calf Mountain, where Park Ranger Betty Gatewood told the group about a project to interest people in the trail, especially high school students, who have worked with Mark Gatewood of the Flying McLeods. 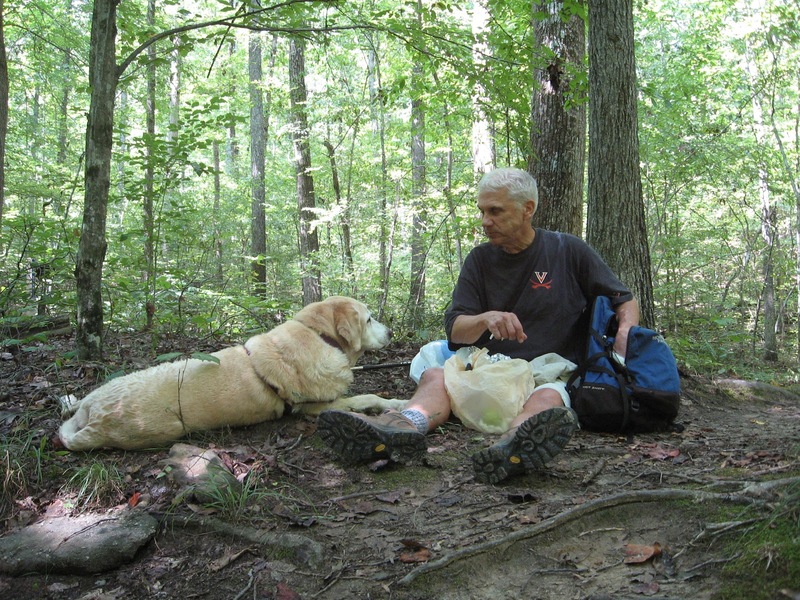 The hikers admired the open area on Calf Mountain, which exists because of the efforts of Andy Willgruber over the last decade, assisted by other members of Charlottesville Chapter. Then the short hikers returned to Beagle Gap. 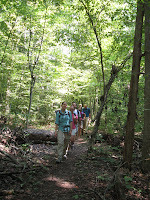 The longer hikers headed toward Jarman Gap, over a section now maintained by Jeff Monroe. Part of the section is a short relocation built several years ago. This part of the hike was spoiled by an encounter with a nest of yellowjackets. 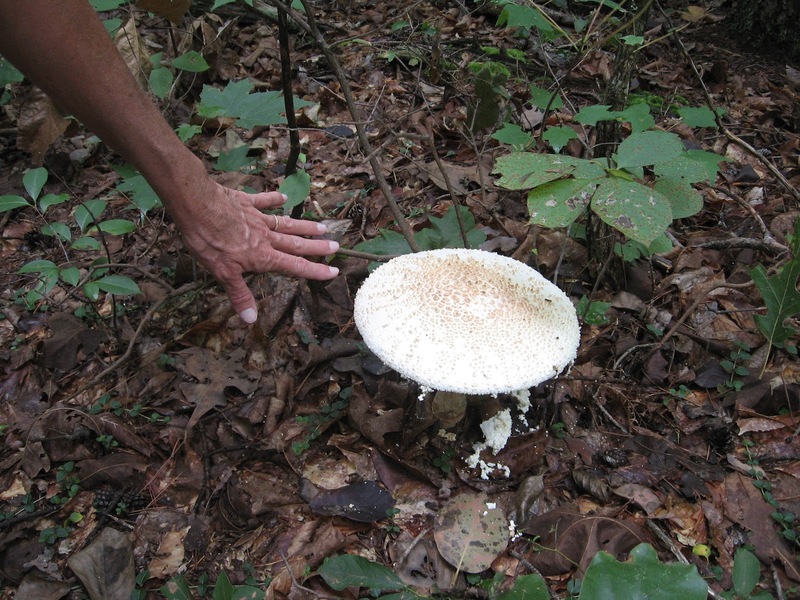 The yellowjackets launched an attack and stung about half the hikers, with Leon Gorman receiving the most stings, which produced large welts. The winged creatures followed Leon some distance down the trail. Upon reaching Jarman Gap, drivers jumped into two vehicles that were waiting to help with a car shuttle to take everyone back to the picnic at Beagle Gap. 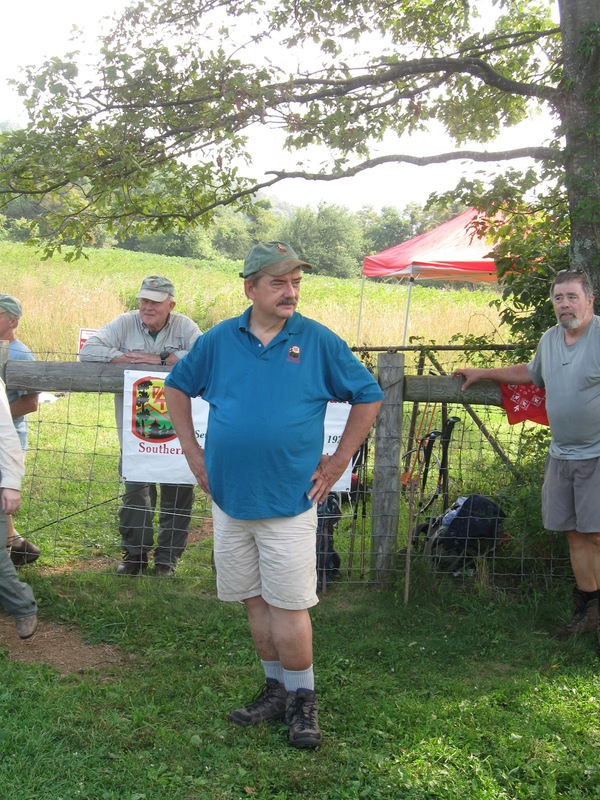 Iva Gillet had suggested that Charlottesville Chapter change the previously planned hike to attend this event because it was an historic event close to us, and a number of chapter members had participated in the trail building. 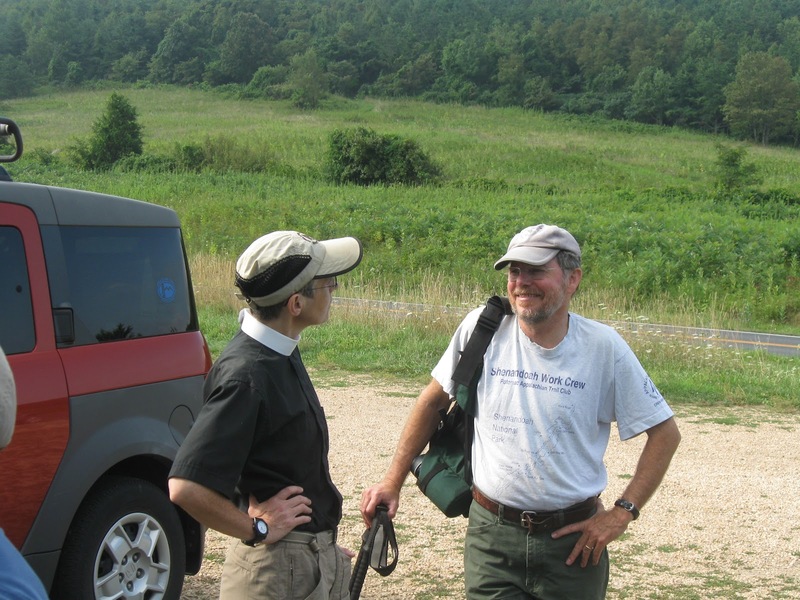 This event also had important elements of the hike that had been planned: the hike was short and involved new trail to most people, it involved food, and it involved major contributions by Andy Willgruber (who was scheduled to lead the originally scheduled hike). A large contingent from Charlottesville Chapter and Southern Shenandoah Valley Chapter attended the festivities and were rewarded with more interesting food than what many of us normally have on a hike. Mark Gatewood and others from Southern Shenandoah Valley Chapter set up tents and signs to make the event more comfortable and to show people that this was not just a picnic. Besides PATC president John Hedrick, other figures from PATC present included Supervisor of Trails Catherine Kelleher (both worked on the relocation), four past and present chapter presidents, and former SNP back-country range Shawn Green, who was involved in planning the project. 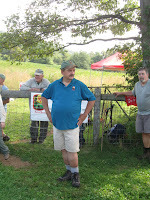 Don White posted an excellent write-up of the event on southshenandoah.net. Within a week, as proof that this trail section was real trail, the first blowdown was reported. 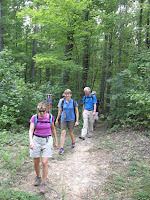 Following the picnic, Andy Willgruber, Marian Styles, and I headed to the site of the former entry station to clear the remaining blowdowns on the club’s section of the AT from the June derecho. 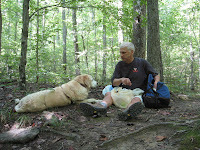 We followed an abandoned trail to the AT, then started the walk to the tree where we stopped last trip. As Andy had suspected, this proved a difficult job. Cutting through the tree to near the bottom was straightforward, but then there were rocks on the ground that a saw would hit. A large lever would have helped, or we could have spent a much more time cutting out pieces, but we decided to leave it and clear trees that were straightforward. A week later Andy returned with appropriate tools and removed the piece of tree blocking the trail. As we walked on, I kept looking at my GPS to locate the next blowdown. We checked one branch on the trail and suspected that someone else had done some clearing, possibly a crew seen by Lindsay Brown a few days earlier. 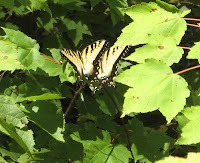 We found one tree across the trail and a couple of logs that have jutted into the trail for a while—things that we wanted out of the trail, but not warranting a special trip. We found one of the recorded blowdowns, which had several branches. We reduced it to movable pieces. Our decision to continue up the trail was correct, rather than assuming all blowdowns had been cleared. We then found what we suspect is new damage, a tree leaning into the trail because another fell on it. The leaning tree was not supported, so cutting it did not carry the usual risks of leaning trees. But collateral damage had occurred in the form of lost blazes. A few days earlier, Lindsay Brown had repainted blazes between Rockfish and McCormick Gaps. This last tree we cut had one of his blazes on it. The same thing had happened on a previous clearing trip. During the descent at McCormick Gap, I noted some waterbars filled with soil. A week later after a hike I stopped to clear the drains and to do a little regrading to reduce water on the trail, plus put in some effort to slow bittersweet. These two projects showed a need for wicking hard hats, to go with wicking shirts, so trail workers do not have hot, wet heads in summer.